I'm currently in that ultra-awkward waiting phase. If I let myself think about labor and delivery or the bringing home of a child to live with us permanently, I'm pretty darn scared. But generally, I am trying to keep busy. Oh, and I also pray sometimes. Jenni recently started her own photography/design business, which is SWEET!! She came by to take some ("absolutely no cheese") preggy photos, and I am pumped about what she created. I especially like this one that she photoshopped. oh my gosh meghan... you are GORGEOUS in this picture! LOVE IT! you have a very talented friend - i just checked out her website and enjoy her work. thanks for sharing! ooh i like the dark hair! but you can't see your beautiful blue eyes! 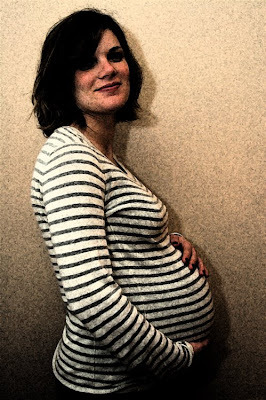 What a great picture, and CONGRATULATIONS on the impending arrival of your new little one!